Our great looking One Owner, Clean CarFax 2018 Ford Fusion Hybrid SE Sedan shines brightly in Oxford White. Powered by a 2.0 Liter 4 Cylinder combined with a powerful Electric Motor that generates a combined 188hp while connected to an electronic CVT. Our Front Wheel Drive regenerates power with ease every time you brake or coast with the incredible ability to recharge the lithium batteries. You'll feel fabulous behind the wheel while scoring near 44mpg in the city and be noticed with a sculpted design that illustrates style with alloy wheels, LED accent lights, a keypad entry, and automatic headlights. Confidence comes standard from Ford with anti-lock disc brakes, traction/stability control, advanced airbags, and the Ford Sync emergency crash-notification feature. Parents will especially appreciate the added peace of mind of Ford's MyKey, which can be used to set certain parameters for your teen drivers. 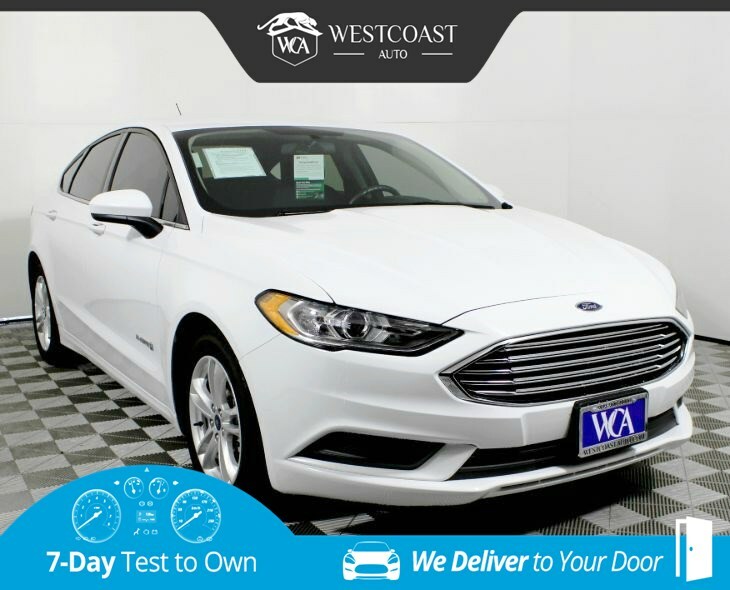 Highly efficient with solid power and security, this Ford Fusion is amazing! Print this page and call us Now... We Know You Will Enjoy Your Test Drive Towards Ownership! Great quality, easy financing and affordable prices aren't the only things that make Westcoast Auto Sales the first choice of many discerning auto buyers. Stop in and See California's Dealer of the Year!